It isn't hard to find your driver if you know the model to find the model of your laptop is not difficult: look at the picture below. Normally for laptop you will find white stickers on the back of the laptop and there you can find the model. So by refer to the picture below your model is no 1 arrow. 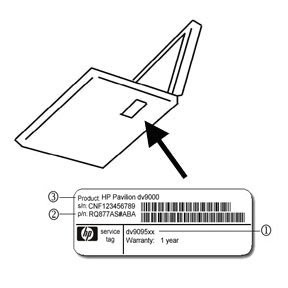 1 Model Number (shown in area below the bar codes) dv9095xx The Model Number is unique to the hardware components, and is the most useful for finding drivers and support content. 2 Product Number (p/n) RQ877AS When using the Product Number to find a part or driver, enter only the letters and numbers before the # sign. 3 Product Name (Product) HP Pavilion dv9000 The Product Name (also seen on the front of your notebook) is not useful, as there may be duplication across several PC models. Thanks for reading How to Identify you HP/Compaq Model. Please share...!